Opened Tuesday 21st October 1913 by PCT in the former banqueting hall of the Royal Hotel. The opening film was Forbes Robertson in 'Hamlet, ticket prices were 6d for the stalls, 1s for the balcony. Orchestral music was provided as an accompaniment. The conversion was by architects Atkinson & Alexander, who provided seating for 850. The contractors were Millar & Sons, Edinburgh; the steelwork was from Young & Co., London, the panelling by Ogilvie & Co., Aberdeen and McLaughlin & Harvey Ltd, London, with fibrous plaster wrok by the Bromsgrove Guild and H Gaze & Co., London. Scagliola work was by Bellman, Ivey & Carter of London, the bronze by the Elbron Metallising Company of London, the bronze entrance doors and casements were by H Hope & Sons, Birmingham, and the marble by Whitehead & Son, London. The cafe and all furnishings was fitted out by J Taylor & Son of Edinburgh. The entrance doors led to a vestibule with paybox and cloakroom, from where a second set of doors led to a long foyer lined with pillars led in from the street, with a lounge off to one side, and fireplace on the other. Steps at the end led up to a small oval tea-room. A single flight of steps to the right led to the entrance to the rear stalls, or further steps up to the balcony and tea-room. The auditorium ran parallel to the street. The proscenium was deeply coffered, and flanked by statues of a lady on either side. The architectural and the decorative designs of the interior are striking in their effect. The style is classic but not severely so. The green marble pillars at the sides of the theatre support a finely modelled cornice, and the coffered ceiling imparts a handsome appearance to the building. The side walls are beatifully panelled in oak, and hung with rich /// tapestry. The proscenium is a fine example of the modeller's art. Passing through the white marble entrance with its pillars in Swedish green, the visitor finds himself in a handsome vestibule and entrance foyer. A tea lounge enters from the vestibule, and at the end of the foyer there is an oval tea-room, pretily decorated in Louis XVI style. Then below the foyer, the biggest of the cafes, 'The Wedgewood', is situated. This large room has been tastefully decorated in the Adams style, with Wedgewood blue as the distinctive colour note. In November 1925, a Hope Jones Unit organ supplied by Wurlitzer was installed at the cost of £7,000, and was inaugurated with a special recital by Reginald Foort FRCO. 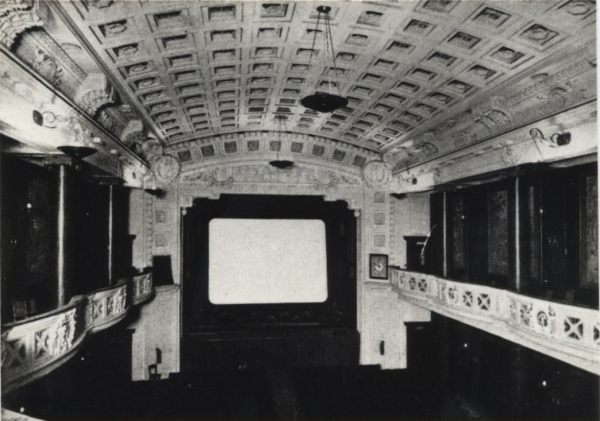 The NPH was the first cinema in Edinburgh to have a sycronised sound installation, and the Singing Fool had a 5-week run at it in 1929. The New Picture House closed on Saturday 26th May 1951, when the site was sold and demolished with along with the hotel for a Marks and Spencer's. The final films were 'Pagan Love Song', and 'Cause for Alarm'. Many thanks to the Cinema Theatre Association Archive for the images and information.